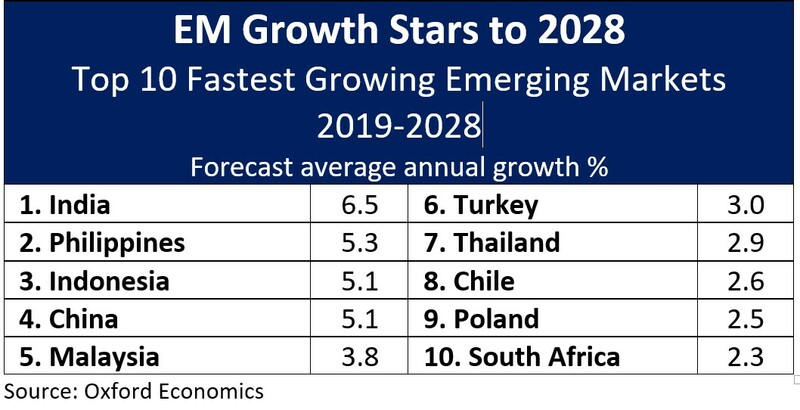 The table below shows Oxford Economics’ estimates of the 10 year annual growth rates of the top 10 emerging market economies. India is projected to surpass China’s population in 2024. It will be the driver of global economic growth that China was in the past 10 years. Emerging markets need to lead the global economy. Europe and Japan are seeing their populations stagnate and decline. Japan’s population peaked in 2009. It peaked at 128.567 million and has since fallen to 126.948 million. Its population growth will continue to decelerate in the future. Plus, its population is aging which limits the dynamism of the economy and increases government spending. Europe is in slightly better shape, but faces the same issues. European population growth will only be 6 basis points in 2019. It was negative from 1997 to 2000. Growth is projected to be negative starting in 2025. This time it will stay negative. It’s important to understand that these emerging market projections aren’t set in stone. The most controversial projection is Chinese growth at 5.1%. Mostly because it has high debt and isn’t successfully transitioning to a services economy. It also has weak demographics like developed economies. It doesn’t have the high GDP per capita other developed economies have. Personally, I’m more confident that developed markets (excluding America) will see very weak GDP growth than I am that emerging markets will hit their targets. India - Emerging markets need to alter their economic policies to expand. Brazil is an example of how this can be difficult. On the other hand, developed countries have mixed economies. They have historically had stable economies, but growth is still low. Specifically, if developed economies became freer and richer, I don’t think their population growth would drastically improve. On the one hand, student loans are preventing American millennials from having kids. On the other hand, historically, the richer a country is, the lower the population growth. To be clear, some emerging markets will meet/exceed economists’ projections. It’s just that economic policy needs to be followed closely. You can’t blindly throw money at them. It’s worth noting some American firms can give you better exposure to international markets than firms based in those markets. Plus, American firms will likely have stronger execution abilities and better accounting. The chart below shows the short term changes to the global economy. 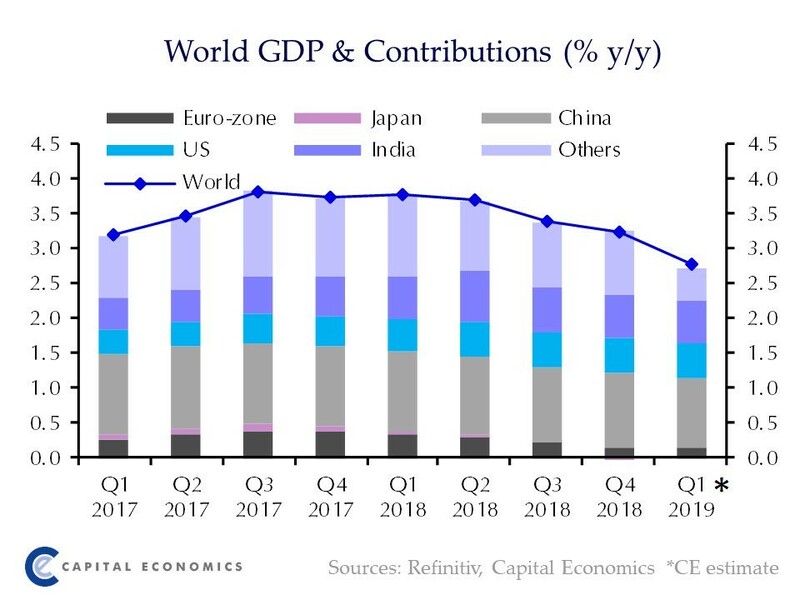 As you can see, even though Chinese growth has steadily decelerated, it will still be the biggest driver of Q1 2019 global GDP growth. While America had a strong year in 2018, the global economy slowed. America’s slowdown is just getting started in Q1 2019. This chart supports Ned Davis’ projection that the global economy is in a recession. To be clear, GDP growth doesn’t need to be negative for there to be a recession. There was a global recession in 2012 and GDP growth was 2.5%. It’s worth noting that even though India will grow quicker than China, it will still have a smaller impact in Q1. I think in the next 5 years the global economy will undergo a transition from relying on China to relying on India. The change will be catalyzed by India’s strength and China’s deceleration. As you can see from the chart below, Chinese retail sales grew 8.2% year over year in February which met estimates. This was the slowest growth rate since 2003. Growth was 9.8% in February last year. Since 2011, it’s clear that any short term increase in growth is part of a long term downtrend. It will be interesting to see if this growth trend reverses as the Chinese government has a fiscal stimulus in place. So far, the stimulus hasn’t stopped the long term trend. The downtrend is catalyzed by a natural deceleration from unsustainable levels combined with the government running out of places to stimulate growth. The country needs to adopt new technologies to get workers closer to the technological frontier. That would increase productivity growth. China’s OECD leading indicator is at 98 which is below the U.K., Europe, and America. The New Year holiday impacted economic results from February, so they could move higher in March. According to Bloomberg Economics, China’s credit growth is 6.6% which is in line with official data. Dow theory suggests transports determine where economic growth is headed. As the chart below shows, the Cass Freight shipments index had a yearly decline of 2.1% in February. Part of the reason this index fell is comps were very tough. The 2 year growth stack was still 9.1%. Monthly growth was 4%. In the next few months comps will weaken. Expenditures were up 5.5% yearly and the 2 year growth stack was 20.6%. It was up 2.9% monthly. Yearly growth in expenditures fell to -10% in May 2016 which means this slowdown isn’t close to as bad as the last one. It also could mean there is further room to fall. Interestingly, there is a solid correlation between construction spending and monthly organic sales growth at HD Supply which is one of the largest industrial distributors in North America. Monthly organic sales growth in the past 4 months starting in November 2018 were 6.8%, 9.5%, 4.3%, and 2.2%. Construction sales were down 2.2% in February. The construction labor market is tight as the ratio of workers to job openings has fallen from a record of 33.5 to 1 in January 2010 to 1.8 to 1 now. The global economy will rely on India in the future. Sometime in the next 5 years, I expect India to contribute more to global economic growth than China. That will be a secular change not a cyclical one. 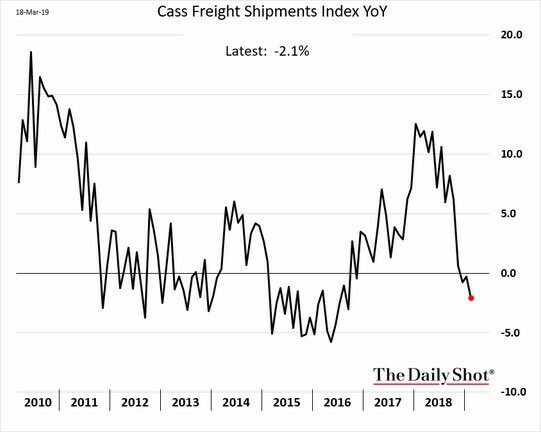 The Cass Freight index is starting to decline which is bad news for the American economy. There has never been an economic contraction without there first being a contraction in freight flows. The ECRI leading index’s worst yearly growth print in 7 years was at the start of the year. That prediction is for Q2 and Q3 of this year, meaning the worst of the slowdown is straight ahead. The good news is growth should recover at the end of the year.